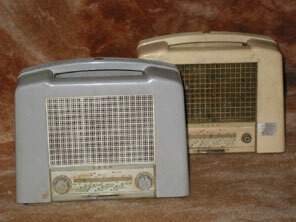 By about 1950 the days of great Ekco design were pretty much over. 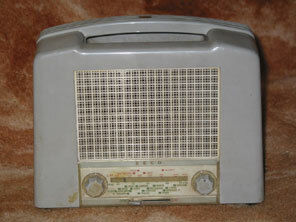 Probably the last receiver from Ekco to make really imaginative use of Bakelite was the U76 Consort from 1948, but following that it was pretty bland thereafter. The exception I've pictured here though is the U159, similar also to the U122 series, and these sets have become rather sought after. They follow a design concept that has come to be known as the "toaster" style, and several similar sets were available from other manufacturers. The main contenders are Sobell and their Sobellete, Decca and their Deccette, and the most famous of all KB and their FB10. The U159 and U122 were both available in several colours. I've seen both the U159 and U122 in cream and grey, and additionally the U122 in light green. Cream is by far the most common for both models, the grey example shown being comparatively rare. Notice the knobs with their clear plastic skirts are colour co-ordinated with the appropriate cabinet colour. The set is a four valve plus rectifier superhet, using UCH42, UF41, UBC41, UL41, UY41. Under the handle is a ventilation area, where a similar squared plastic to that used for the speaker grille is positioned to allow heat to leave the cabinet. The set still suffered from temperature build-up though, and many sets are found heat damaged, particularly around and on the carrying handle. The set is reasonably easy to service, as the base is retained by four screws, and removing these provides access to the components underneath the chassis as well as valves bases where voltages may be measured. To gain access to the major components (eg valves, transformers etc) a further four hexagon posts need to be removed to allow the entire chassis including speaker, control knobs and dial to be slipped from the cabinet.